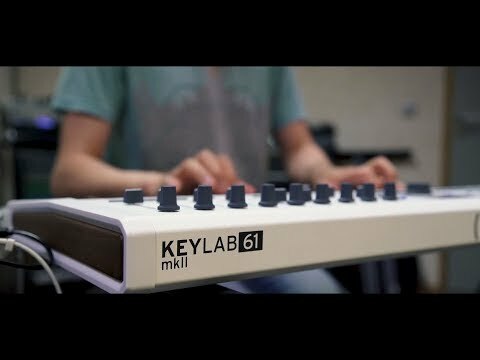 Arturia’s premier MIDI controller, KeyLab MkII represents a quantum leap in terms of control, quality, and expression. Featuring a responsive keyboard action with 61-keys, aluminium chassis, advanced configurable interface, 16 RGB backlit performance pads, 9 large faders, 9 rotary encoders, 5 expression control inputs, 4 CV outputs, smart category controls, and - of course - MIDI and USB connectivity. Included is an impressive software bundle: Arturia’s complete Piano V virtual piano instrument, Analog Lab 3, and Ableton Live Lite. Dimensions: 875 x 297 x 53 mm.